In this Edu bit we will explain how to integrate Google's G Suite to motivate students and develop five key competencies: self-management, collaboration and communication, critical thinking, creativity and innovation, and social and personal responsibility. At Tec High School, Prepa Tec, the Tutoring and Integral Well-being courses are part of the academic subjects that seek to accompany students to ensure their academic success throughout their studies at the institution. However, in reality, many students think that the topics addressed in these classes are irrelevant, serve to “fill out” the curriculum, are a waste of time and should be eliminated. In my opinion, I do not believe that the problem lies in the course content, but rather in the approach used to address them. To tackle this problem, tutors at Tec High School, Campus Morelia, decided to include in these classes applications that are fun, versatile and engaging for students. This article explains how we integrated Google educational technology to help us achieve the proposed pedagogical objectives, encouraging students to develop the expected competencies in these classes. We focused on developing five formative competencies for students’ lives: Self-management, Collaboration and Communication, Critical Thinking, Creativity and Innovation, and Social and Personal Responsibility. Self-management is promoted in students through goal setting and fulfillment, applying continuous self-assessment strategies. The first activities implemented at the beginning of the course consist of scheduling the most important activities and setting up reminders for mid-term exams, weekly quizzes, events, extracurricular classes, etc. For this, students use the Google Calendar application and enable notifications to make it easier to remember delivery dates and pending activities. They then create a folder for each class in Google Drive where they will save the corresponding material, activities and tasks that will be available at all times. We also foster the use of Google Keep to create notifications, lists and important class notes. To develop the collaboration and communication competency, students learn how to identify valid information, interpreting, deducing and "listening" in an empathic way. All the Google docs applications allow students to collaborate in editing content at the same time and even remotely if necessary. The teacher and students can identify who is participating, who did what and when. For external communication, we use Google+ to create communities to address different topics, such as student achievements, invitations to talks, conferences, cultural events, etc., where everyone can participate, share and give feedback to their classmates in an enjoyable way. For the social and personal responsibility competency, we foster responsible decision-making in students, selecting options that will favor their life project. We carry out activities for managing emotions and values using Dr. Martin Seligman’s PERMA model for integral well-being and the four emotional intelligence RULER tools created by Dr. Marc Brackett from Yale University. To achieve this, we use Padlet, which offers a direct link to Google Classroom in the form of a forum or class assignment. This application is handy, particularly for making collaboration walls where students can share ideas on a topic (their prior knowledge of the subject, what they would like to know about the subject and ultimately sharing what they learned about the subject). One of their favorite activities is the "Wall of Gratitude" where they post topics related to positive emotions. According to Dr. Seligman, being grateful generates well-being. Students can ‘like’ their classmates' posts and make comments. Padlet as such is not an application developed by Google, but it is in Google Play Store. It can be used on cell phones or tablets and linked to Google Classroom. The creativity and innovation competency encourages students to generate new ideas, solve problems creatively and develop innovative, socially valuable proposals. One of the crucial stages is to achieve empathy with the community or sector with which they will be working, so conducting interviews with stakeholders to understand their needs better is of utmost importance. For this, we use Google Forms to collect all the information and comments in an organized manner and then analyze them in Google Sheets. We also use a YouTube channel, where video interviews are kept and important information compiled for the project, and Google Street View to make 360o videos. To track the progress of the projects, Sci Journal allows students to take notes on the activities in writing or using photographs or voice notes. To develop the critical thinking competency, students learn to analyze formulated judgments, question and argue their points of view, applying information validation criteria. This requires literature reviews, which can be conducted using the Google Scholar search engine, where students locate citations and academic papers, journals and e-prints, among other works. Students are also asked to use the Google Docs Explore tool to search for information and use citations appropriately in various formats, such as the American Psychological Association APA, Modern Language Association MLA and Chicago style. Explore can also be used to search for images, with all of the ones found being copyright-free. The Nearpod application offers excellent free lessons on citizenship and digital literacy. Students can create or upload their lessons and presentations from Google Drive to share with students and covert a simple presentation in Google Slides to something more interactive with quick exams, surveys, pools, memory questions among others. Another application that links directly to Google Classroom, and that we also use to develop this competency, is Edpuzzle, for editing YouTube videos, quizzes or reflections on a chosen video. To drive metacognition, which is students’ capacity to self-regulate their learning processes, we use Recap and Flip Grip, both of which enable students to create video-based reflections on their activities and projects. Students especially like Flip Grip because they can share their selfie and add stickers and emojis. It is worth mentioning that the videos can be downloaded to be shared or to form part of the student's evidence portfolio. Reviewing and providing feedback on assignments becomes very simple with Google Classroom since teachers can comment on improvements and know when students resolve these comments. They can also check who edited a document and the date on which it was done, using Classroom Grading Tool or Doctopus, which gives teachers the option to create a Google doc for each student with editing restrictions, rather than students creating their own. Seeing how students develop the formative competencies across the semesters is extremely important and is achieved with the evidence of each of the six formative skills collected in their electronic portfolio on Google Sites. 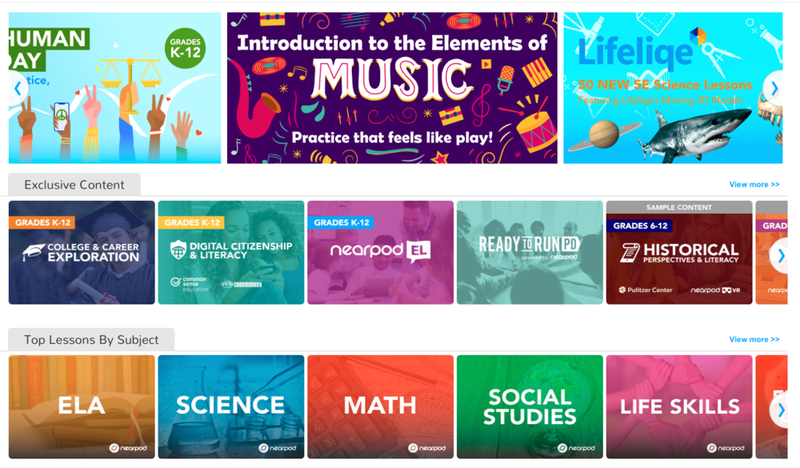 Google has an educational platform that offers a variety of ideas on how to use tools in the classroom to engage students and achieve more meaningful learning. I would like to invite you to explore the applications described in this article for your classes and share your experience and the outcomes with us, so that, together, we can strive to improve education. Look out for the free Google application Course Kit, which enables educators to use Google Drive and Docs to compile assignments, give students feedback and share course materials in any LMS. Arlette Audiffred Hinojosa (arlette.audiffred@itesm.mx) is a multicultural professor at Tec High School, Campus Morelia, teaching the Tutoring and Development classes. She collaborates on social entrepreneurship projects with communities in Cherán, Michoacán, and on Tecnológico de Monterrey’s educational innovation NOVUS projects.